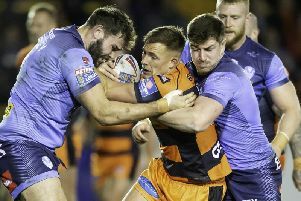 Former Saints’ boss Mick Potter knows exactly the kind of skills new signing Kevin Naiqama will bring to the Totally Wicked Stadium next season. Potter, who held the coaching reins at Knowsley Road in the 2009-10 seasons and until recently coached the Fiji national team which 29-year-old Naiqama skippers, believes St Helens have landed a gem. The 54-year-old Australian said: “Ever since I’ve known Kevin, he’s always been a born leader. Even though he didn’t have the international captaincy early on, he eventually earned that honour and it was well deserved. “He can boss a few people around but he also shows composure under pressure which I think is really important. The 29-year-old’s impending move from Wests Tigers on a three-year deal doesn’t necessarily mean that first choice full back Ben Barba will be returning to Australian without completing his current contract, which runs until the end of the 2019 campaign, and this week’s ‘hands-off Ben’ statement from Saints’ chairman Eamonn McManus sends a strong message to any would-be suitors. Naiqama can play either at full back, centre or on the flanks, and will give an already highly talented three quarter line even more flair than ever. Saints are also expected to offer long-serving Jon Wilkin and Dominique Peyroux new deals as their existing contracts expire at the end of the season. Wilkin, who has been a cornerstone of the Saints’ side since joining from Hull KR in 2002 and a winner of a plethora of trophies in that times, is keen to stay and the same can be said of Peyroux whose future prospects at the club didn’t look too bright towards the back end of 2017 before he suddenly hit a rich vein of form. Justin Holbrook, who had only taken over the coaching reins in May, said: “I just loved what he was doing when I arrived and how determined he was to cement his place in the squad. “In all honesty, he hadn’t produced his best form in the previous 18 months but we decided to keep him and now we are reaping the rewards. Former skipper Wilkin is also benefiting from being utilised more sparingly in games than in past years - and his level of performances have reflected the wisdom of this decision. Judging by the Australian’s thoughts, he will be keen to keep the pair on board at least for the 2019 campaign.